To enter a new Time Off or view an employee’s Time Off, you can click their name anywhere in the system and then click the TIME OFF tab. You also can generate a Time Off summary for any time period using a custom report in the REPORTS section. The Time Off Requests page also shows all employees and their approved Time Off. By choosing various options in the dropdowns, you can set the display for that page. You also can filter to display only certain Positions or shift Categories. 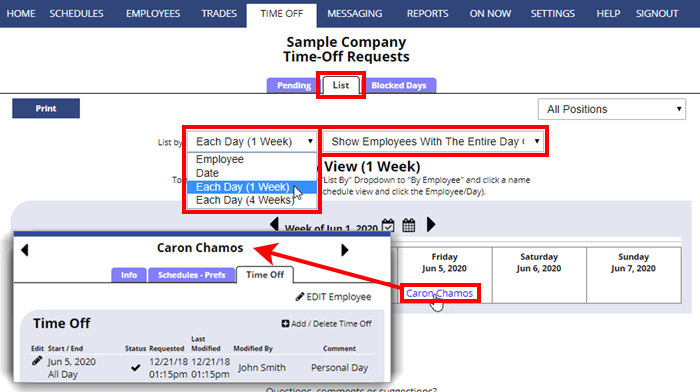 Click any employee name to open the Time Off window for that employee and you can add a new Time Off and review all of their Time Off requests (past and future).